Last week we highlighted our various blending brushes and talked about how to use each of them. Today we’re focusing on powder brushes! Powder (along with other powder products such as blush, bronzer and highlighter), can have a huge impact on your overall makeup application. Get the breakdown of all five of our powder brushes and find out which ones would best fit your makeup needs. F10 – Powder/Blush – This brush is soft and slightly beveled. It works great to apply blush or bronzer along the cheekbone and also for pressed powder on areas where you want to diminish any shine. F15 – Duo Fibre Powder/Blush – This brush is similar in size to the F10 but has duo fibre bristles, making it an essential tool for light powder placement or applying blush for a diffused and soft finish. 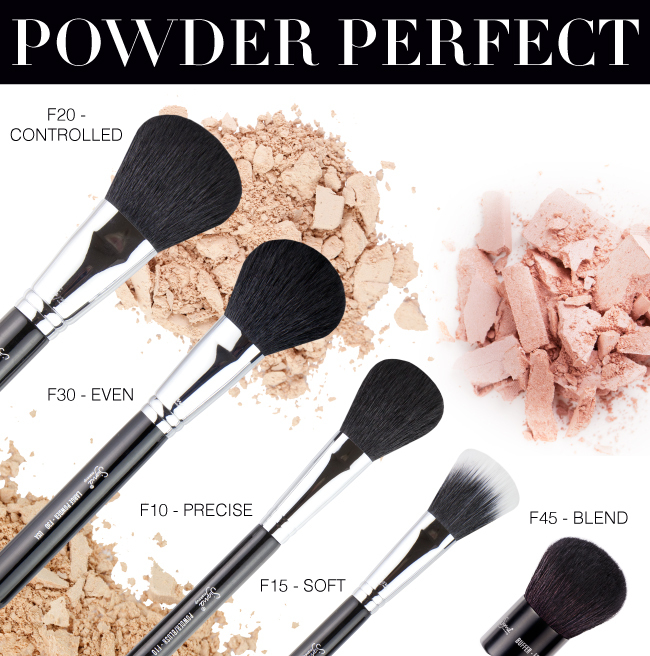 F20 – Large Powder – Our most popular powder brush! This is you go-to for all over powder application. Use it to set your foundation by applying loose powder on the areas that tend to get oily throughout the day. F30 – Large Powder – Wondering what the difference is between this brush and the F20? The F30 is slightly denser, making it an ideal choice for application of powder or bronzer to larger areas such as cheekbone, forehead and neck. F45 – Buffer – Last, but not least! This compact powder brush is known for its ability to seamlessly buff mineral products and pressed powder onto the face. It can also be used to soften harsh lines following blush application and contouring. Which brush (or brushes) do you use to apply various powder products? The F30 is my favorite, I call it the pimp daddy of powder brushes! It is big and fluffy, but firm so it doesn't fling powder all over the place. Love it! Hope you can also take a look at my fashion blog!